As a six year old I was expert at making chocolate fudge that was the best I have ever tasted. Yes, I am a show off! But, of course it was full of sugar; cups and cups of it. 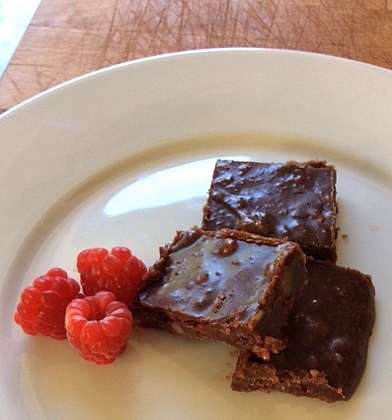 Going primal and refined sugar free, well my fudge is no longer an option 😦 So when I came across this recipe from RAD Cooks – wow! I love that the recipe encourages you to try other flavours. I am going to go with the coconut theme and add some desiccated coconut. It is actually kind of interesting. Christy, the owner of Honey Mama’s, is my neighbor. She is super nice and seriously has a passion for this stuff. She sells to stores in Portland, and is expanding to Washington! She even ships… its a dream. And, you know the video, Honey Mama’s: Redefining Fudge, on her about page? I directed and edited it! She was awesome to work with. Anyways, you have to try her fudge. My imitation is good, but who can refuse fudge made with an old family recipe made by a wonderful woman, in a cute package? Where my fudge diverges from hers is the accents. I have developed a spice and a fruit version, in addition to the original.